Here at Scallionpancake headquarters, we are obsessed with Phil Rosenthal. You might know him as the creator of Everybody Loves Raymond, but we know him as the star of the best food show in the world: Somebody Feed Phil. Phil is our type of guy. He’s Jewish. He loves good food. He loves to travel and centers his travel around food. And he would talk to anyone or anything. We can’t say enough good things about Phil, and he seems like the nicest guy in Hollywood. Phil has been many places we have been, including Copenhagen, where we basically used his episode like a travel guide and he did not disappoint us. So when we knew we were going to LA, Phil’s home, we had to go where he said to go. Phil’s Los Angeles episode came out in 2015, but a lot has changed in three years. 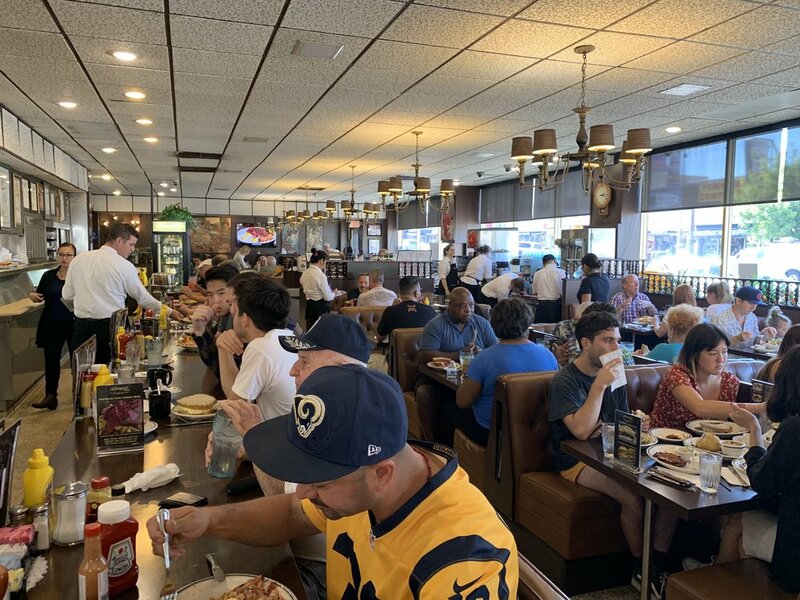 Some places have shut down, moved, or changed chefs; however, the one place that has not changed and will probably never change is Langer’s Deli. Langer’s is a Jewish style deli that was opened in 1947 by Albert Langer to cater to an influx of Jews that were moving into Los Angeles. He bought the space for $14,500 and started operating the deli with just his wife and a dishwasher. 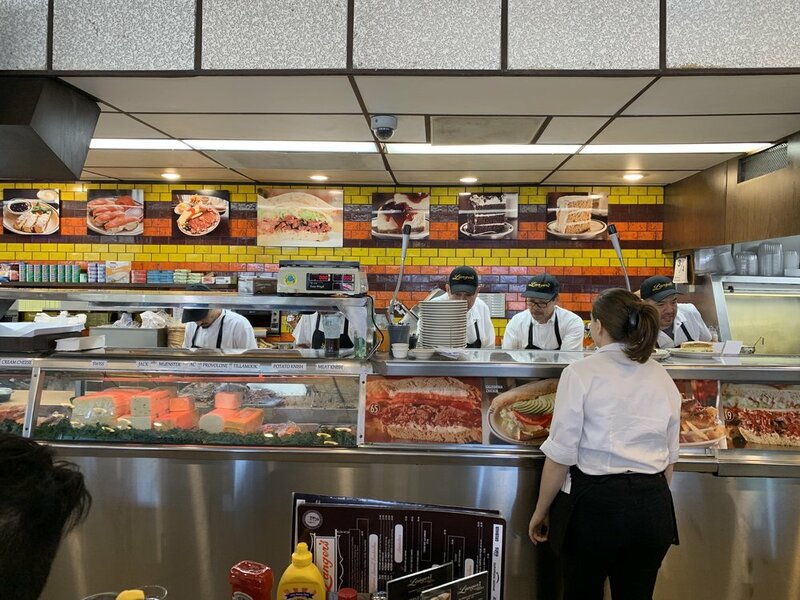 Today, Langer’s is an institution, receiving the American Classic award from the James Beard Foundation in 2001, and, of course, receiving the highest accolade by Phil, who named it the best Pastrami sandwich in the world. There are very few traditional Jewish delis left in the country. Most in New York have shut down, leaving Katz on the Lower East Side as the lone survivor. 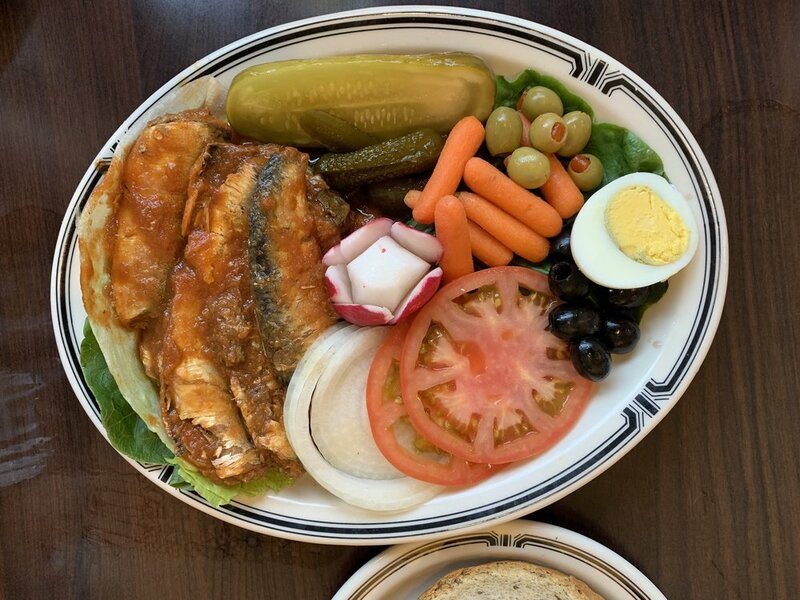 Langer’s is the NY Jewish Deli of Los Angeles, and in a lot of ways it outshines the New York originals. We went to Langer’s with my parents, knowing that my dad loves old school Jewish delis. He talks about dearly departed ones in New York a lot, and whenever we go to a city he is always looking for that slice of the past. My dad has also recently taken up eating meat, after about a 20 year hiatus. So it was go-time on pastrami. My dad, and my grandma, and probably my grandma’s grandma, also have a yearning for good Jewish rye bread, which we just don’t get in Charlotte. I guess the one good thing they could get in the shtetls in Europe was rye bread. Once you’ve had a real rye, it’s hard to go to the local bakeries and feel impressed. So, if you want to remain impressed by Charlotte’s bread scene, don’t go to Langer’s. If you are going once, there is only one thing to order, and that’s the #19. This is a pastrami reuben with hot pastrami, Swiss, Russian dressing, and coleslaw served on their famous twice baked rye bread. When the waiter gives you the menu with a million items don’t even look at it. PUT THAT MENU DOWN. Don’t try and out think your Langer’s experience, do what you came here for and get the #19. If you’re going with multiple people, let them make the mistake of not getting the #19. This is as good as advertised. You haven’t had pastrami until you’ve had the hot pastrami from Langer’s or Katz Deli. What sets this apart is the rye bread. It’s the best rye bread in the world. They don’t make the bread on site, but they bake it again once it gets to the deli, which makes the crust perfectly crunchy and the inside so soft. Here’s the sign of a great place. Their fries were outstanding. They were the perfect balance of slightly crunchy on the outside and soft and moist on the inside. 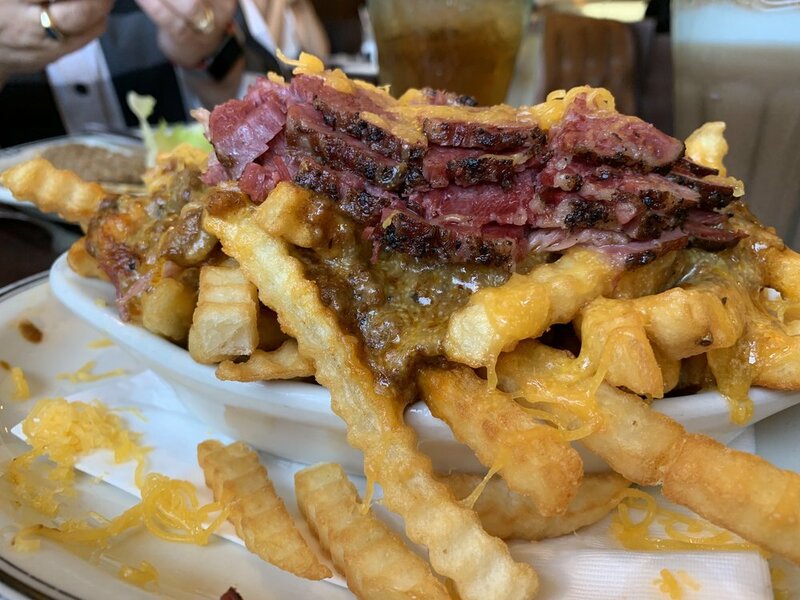 Top it with their famous pastrami and cheese and YAHTZEE ––you’ve got yourself a new Langer’s classic. You are either into sardines or you aren’t. If you are, these sardines swimming in tomato sauce are delicious and a great way to start your meal. Plus they come with a side of rye bread, which you will want to start hoarding immediately once you taste it. Egg creams are staples of traditional Jewish delis. They consist of milk, carbonated water, and chocolate syrup. (Confused? Yes, there is no egg or cream in the egg cream). I guess this was a tactic back in the day to get your kids to drink more milk. 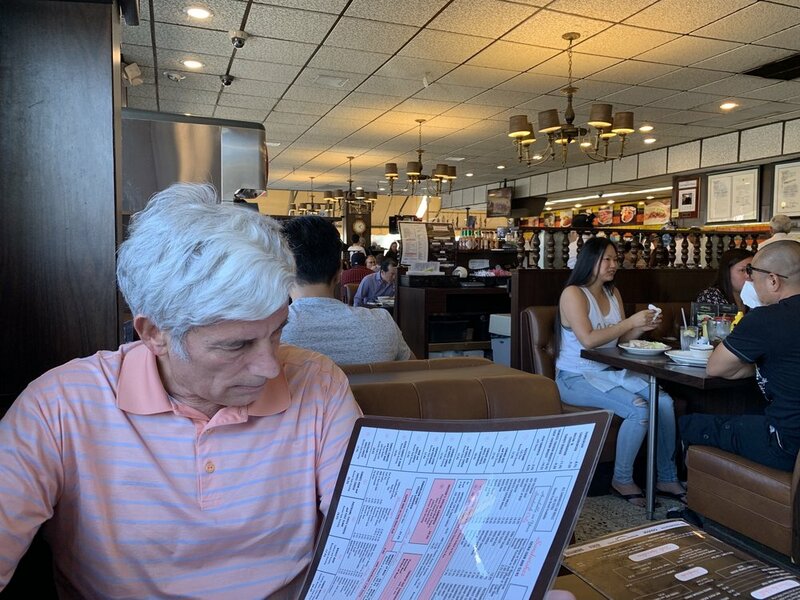 If you’ve never had an egg cream, Langer’s is a great place to have your first. Langer’s has the old school Jewish vibe down pat. You walk in and you feel like you’re in 50s or 60s New York, but with a classic Los Angeles twist. This article from the Los Angeles Times in 1986 paints a great picture of some of the conversations happening at Langer’s and the atmosphere, which hasn’t changed in 60+ years. It’s a great place to bring your parents or grandparents just for this reason––they’ll feel like they are back in time. Our waiter, Peter, seemed to have worked at Langers for 30+ years, like most of the other waiters. The place is run like a well-oiled machine. There is a line to wait in outside before you are seated, but on the Saturday we went, we only had to wait about five minutes. Once you’re in, you’re taken to your seat and the magic begins where you hop on a time machine a few decades back. The extra touches are added, such as extra rye bread, pickles, or whatever else you need. You also pay upfront at the cash register, right in front of a Dodgers #19 jersey. If Frankie could be made into one bread when he dies, it would be the rye bread from Langer’s; #19 happens to be the best thing on the menu and Yvonne’s favorite number, so it worked out well for her; Pro Tip: Don’t be scared to order two #19s and take one home with you; My mom ordered the chopped liver sandwich, and that was a huge mistake; Don’t miss the halva by the cash register when you’re checking out! 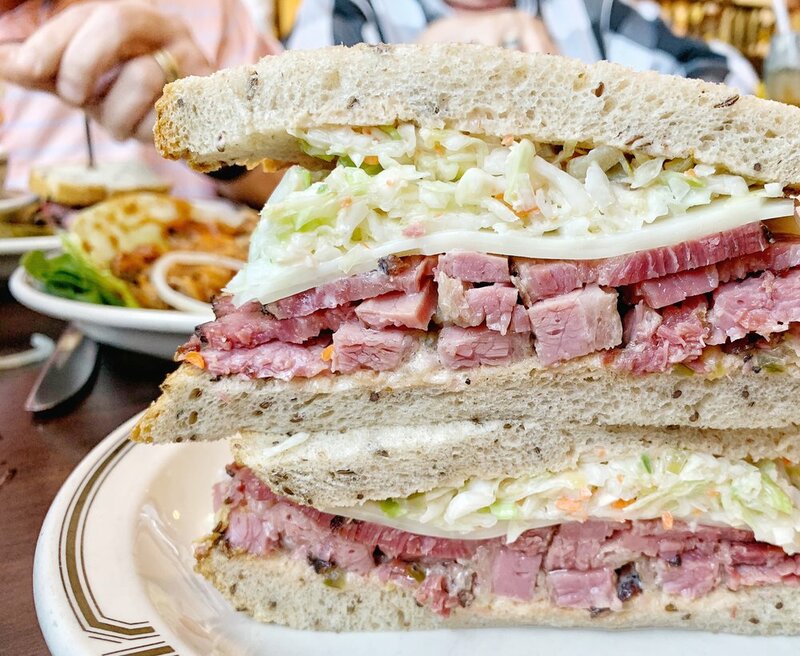 Langer’s is the best Jewish-style deli on the West Coast. It might even be the best in the US, and this is coming from both Phil (a native New Yorker) and Jason (lived in New York for seven years). Bernard (my dad) also said it was the best of the best, and was glad we made a detour to go. As Phil knows, a compliment from your dad that a restaurant is good is pretty much the highest compliment a place can receive. PS––the fact that I just wrote Phil and Jason in the same sentence made one of the top 10 moments of my life.